We went to Sushiya no Nohachi (すし屋の野八) because of a gimmick. 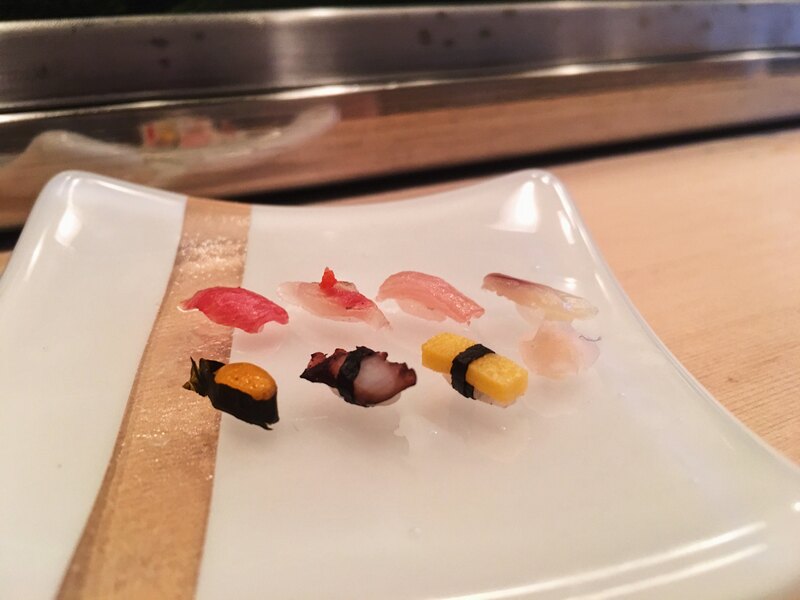 This sushi restaurant is known for their one grain of rice sushi 一粒寿司（）, which is exactly what it sounds like: very tiny sushi. What we didn't expect was to leave feeling like we had discovered a really great sushi restaurant (as opposed to the ones you might find elsewhere). So don't confuse the gimmick with the overall quality. They were both excellent. 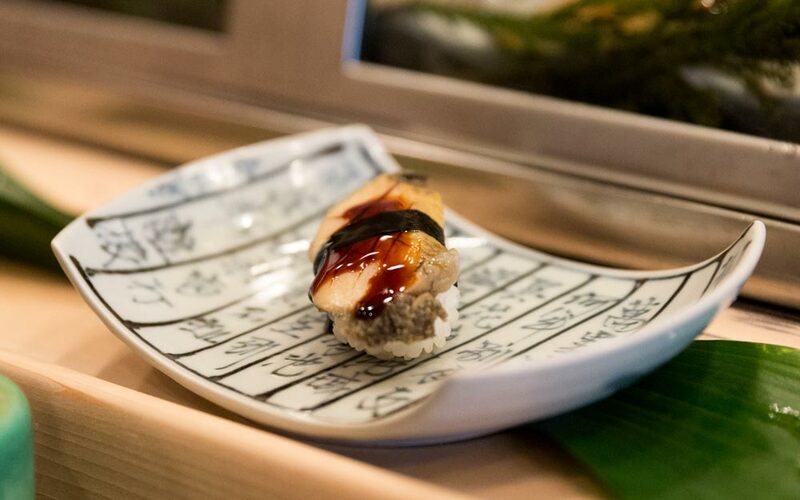 Read on, whether you want to know about the tiniest sushi in the world or just some good old-fashioned Edo-style sushi. The tiny sushi idea originally came from a customer in 2002 who challenged the owner's son to see how small he could make a piece of sushi. 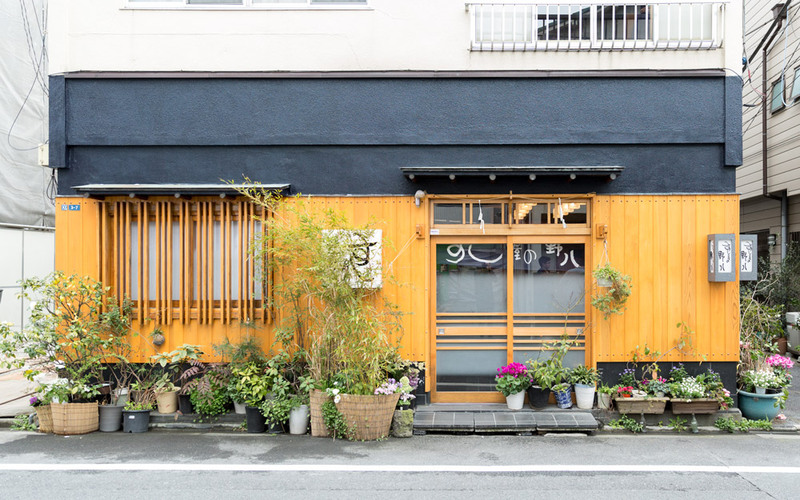 Sushiya no Nohachi is located on a small, quiet street of the famous tourist area, Asakusa. The wooden walls and dark paint make it stand out and gives it a sort of old-but-new vibe. 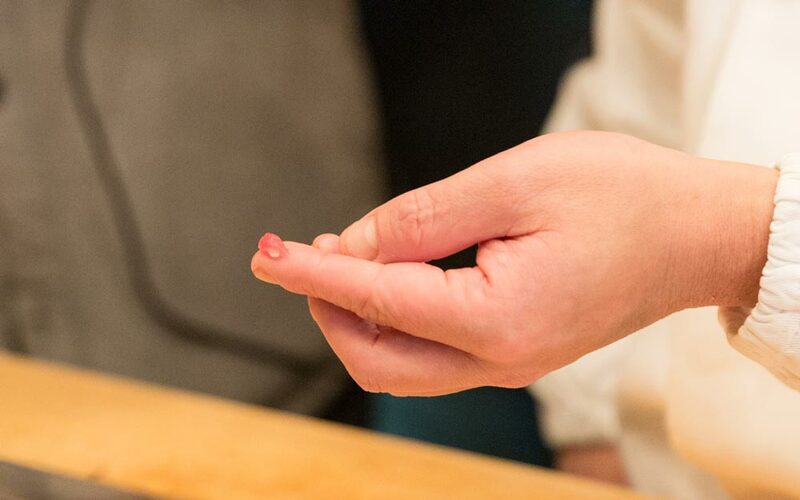 The tiny sushi idea originally came from a customer in 2002 who challenged the owner's son (Ikeno Hironori) to see how small he could make a piece of sushi. Over time, it became something they were known for. That said, when we asked how often they need to make a plate of small sushi, we were surprised. "Just a few times a week and at most five times in a day." Though when customers from overseas order, they tend to be extra enthusiastic about the tiny sushi. He told us that one woman from Europe burst into tears and cried for an hour and a half after seeing the cute, little sushi. Somehow we managed to keep our own emotions in check. "How much does it cost to order the tiny sushi set?" I asked. "It's free, actually!" Hironori said. That's right, if you come here, you can get eight types of tiny sushi for for free, as long as you purchase a regular-sized sushi course. This will run you around $50 USD. But if you come here, you should be excited to get the sushi course. It is exceptional (more on that later). 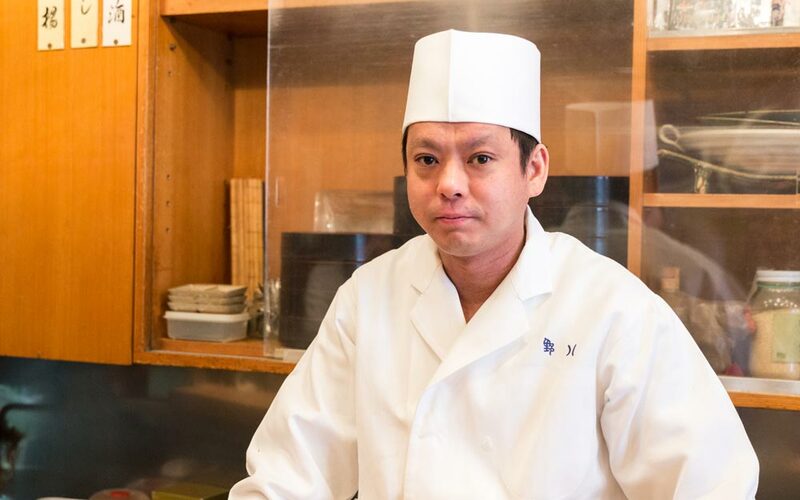 Despite its size, Hironori told us it actually takes longer to make the tiny sushi—roughly seven and a half minutes—so please be patient. 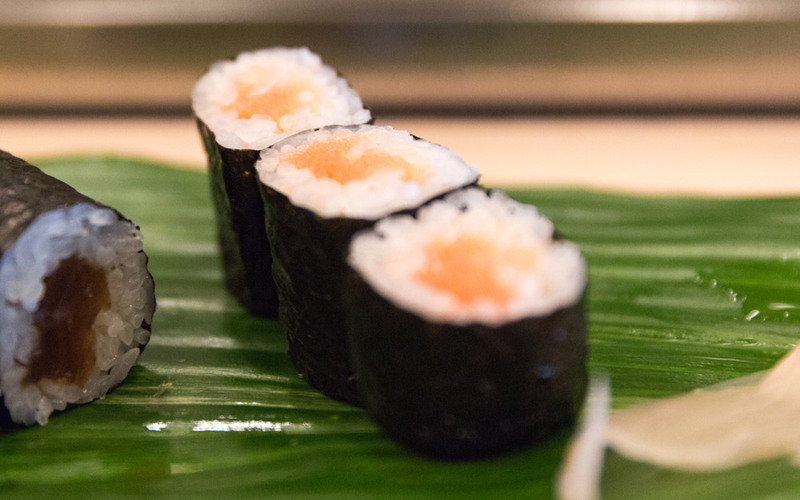 Some can be made quickly, like the regular sushi with a grain of rice and something on top. Here's the finished product. It really is tiny! 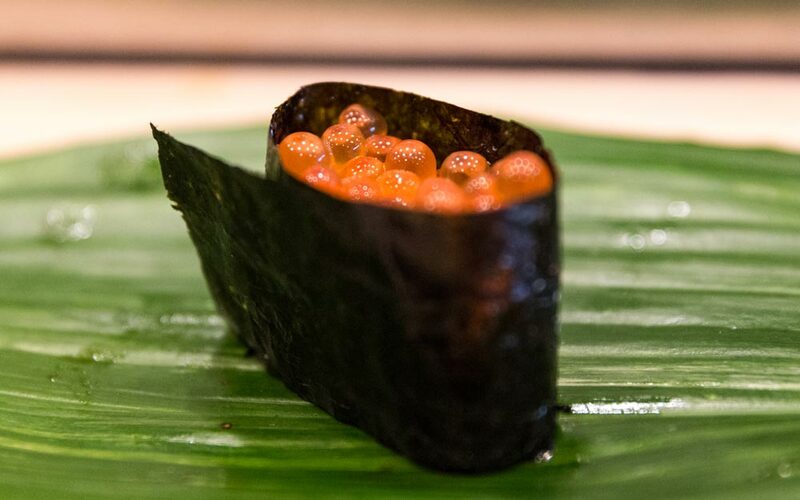 The most difficult tiny sushi are the ones with nori seaweed—those are the sea urchin and egg. For sea urchin, he has to put a small piece of nori around a grain of rice horizontally. For egg, he has to wrap the nori around the egg and grain of rice. It's pretty impressive to witness. Agh! What is this magic? Not only that, depending on the season, wrapping the nori can be more or less difficult. "If it's winter, the nori tends to crack. If it's summer, it gets soggy quickly. The best time of the year for this is actually spring!" he told us. 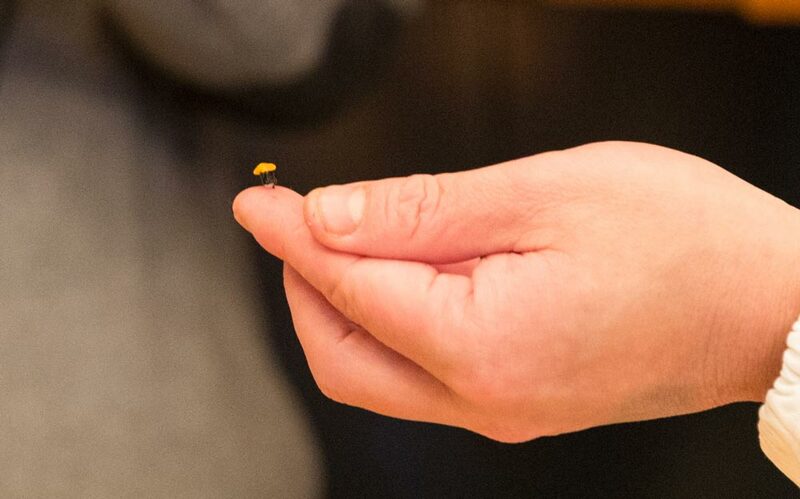 So if you want the best possible miniature sushi experience, spring is the time to come. So we got our tiny sushi, but as we mentioned earlier, you have to order a regular course too. We were going to do that anyway because we were hungry, but we didn't expect it to be as good as it was! Any place with a gimmick can't be that good, right? After trying their regular (not tiny) sushi, we immediately understood why people come here. It's not for the gimmick. Most locals come to Sushiya no Nohachi not for the tiny sushi, but for the Edo-style sushi, called Edomaezushi 江戸前寿司（） in Japanese. 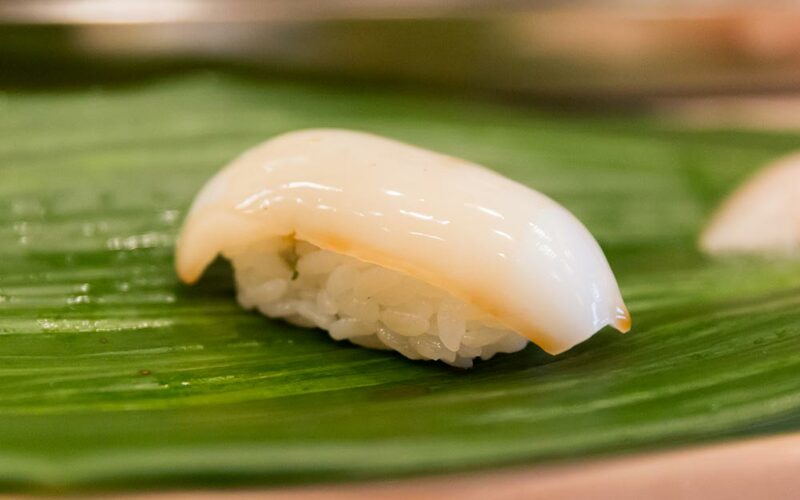 Edo-style sushi was invented in a time before refrigeration, so they would do things like marinate the sushi in soy sauce, boil the shrimp, and/or sandwich flounder between sheets of kelp. You know, all the standard things you learn when you get a food handler's permit. 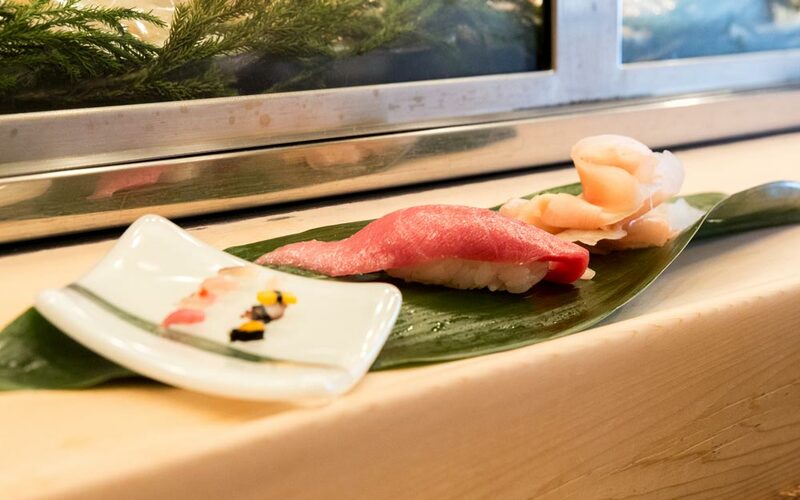 But even with access to refrigerators, Sushiya no Nohachi still makes sushi the old-fashioned way. For example, they make the conger eel softer by boiling it beforehand. Or they firm up gizzard flesh by soaking it in vinegar. Sometimes they use a new technique called "sakurajime," which tightens fish flesh using cherry blossom leaves, giving it a better texture. 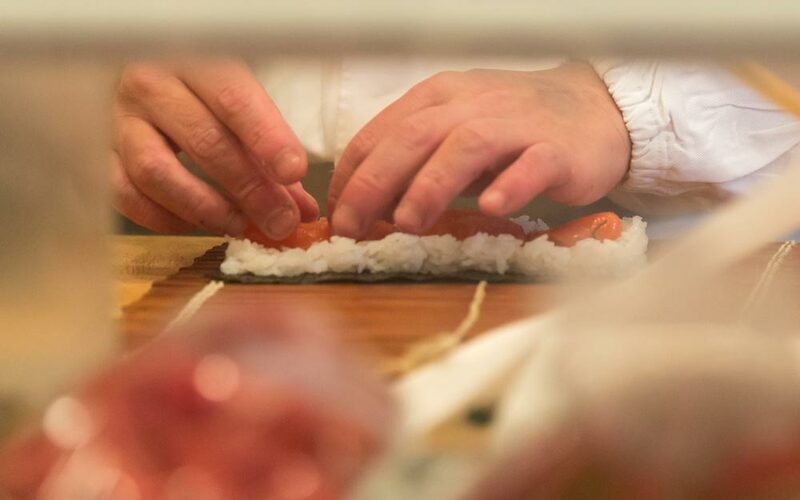 It's all time-consuming stuff, but this extra effort is what makes it "Edo-style sushi." Sushiya no Nohachi has the widest variety of sushi toppings in Asakusa (around fifty, they said) and they use fresh ingredients which mostly come from the Tsukiji Fish Market or are sent directly from Hokkaido. It's not just seafood though. They get vegetables directly from local farms. 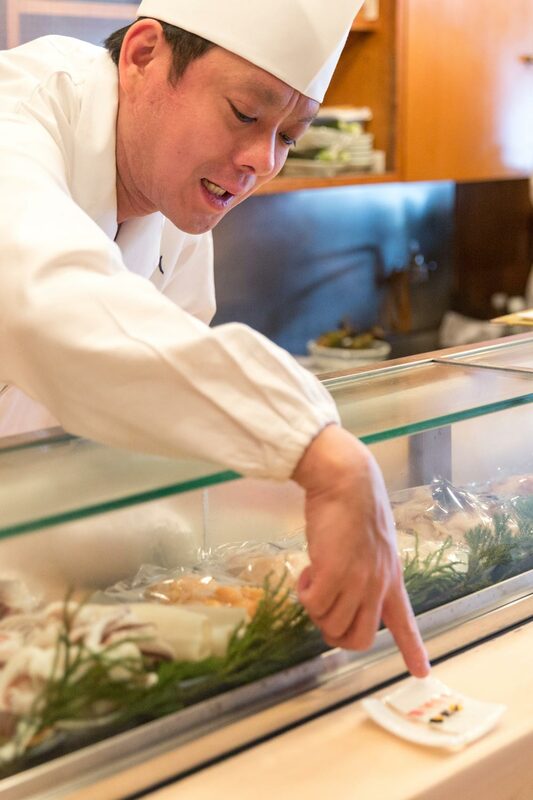 All the hard work of Edo-style sushi, plus the fresh ingredients, have made this a place with a lot of regulars. And since they are close to Ryogoku, some of those regulars are sumo wrestlers. One of them has eaten one hundred sushi by himself. I can't imagine what the bill on that order was. Since there were so many options, we didn't know what to order. In the end, we went with the chef's choice, which has twelve kinds of sushi. It helps if you're a regular and they know your tastes. But you can also just tell them the kinds of things you like, don't like, and your budget, and the chef will make a custom course just for you. After talking for a bit, our food started coming out. I thought the order of pieces and the pacing were really good. But would you expect anything less from real sushi professionals? First up, we had shima-aji, that is, striped horse mackerel. Shima-aji is known as the best kind of aji. 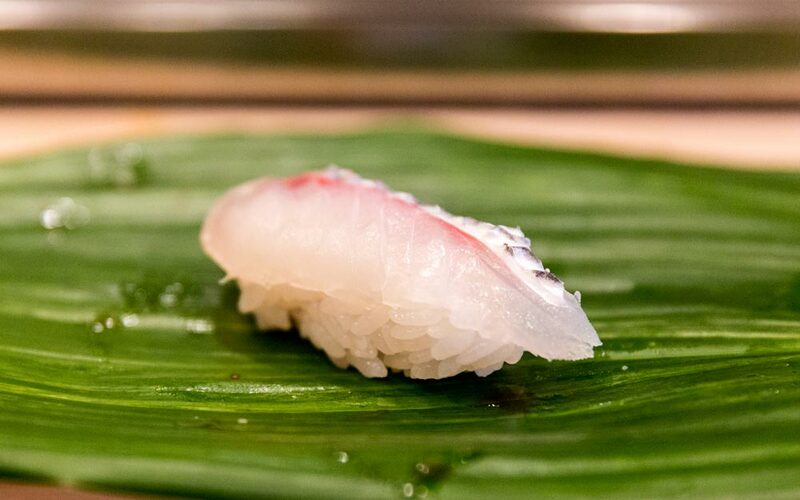 It's a lighter flavored fish, the perfect way to start a sushi course. It was plump and noticeably fresh. As you can see, the topping is fairly thick, which is another feature of Edo-style sushi. Depending on the part of the body, there are different ways to slice the fish meat to get adequately-sized cuts. Speaking of Edo-style sushi, we were curious if there was a specific way we should eat them. If you're having trouble using chopsticks, we have some good news: the chef told us it's better to eat them with your hands. They actually form the rice with this in mind! It's a little fluffier and not as compact, so holding it correctly makes sure it won't fall apart! Also, Edo-style sushi is generally pre–seasoned. You don't usually dip it in soy sauce or anything. 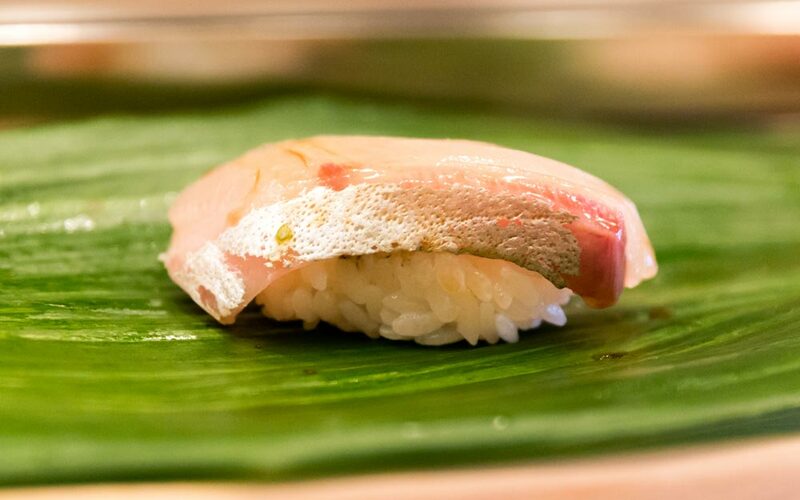 Just pick up the piece of sushi with your hand and place it on your tongue upside down (fish down, rice up). That way, you can taste the flavor better. The second item we got was sumi ika, literally "ink squid." 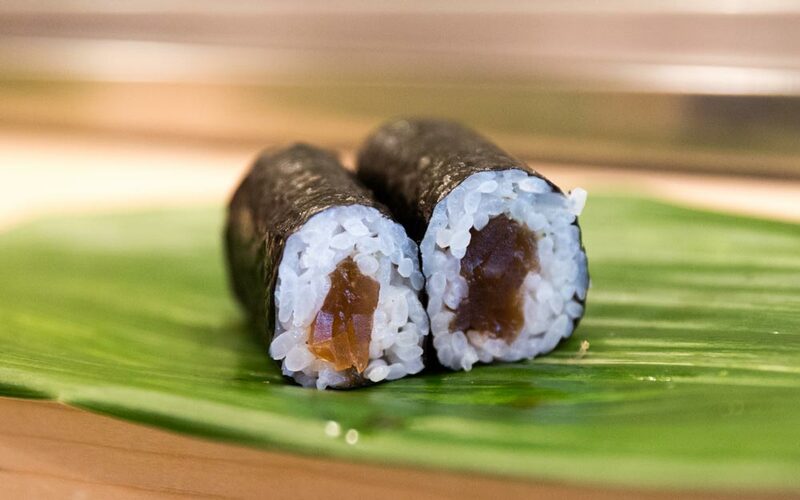 Sumi ika is a staple ingredient in Edo-style sushi or tempura. It had a nice texture and a natural sweetness. Third, we got kuruma-ebi, a.k.a. "Japanese Imperial Prawn." It was big! I was surprised by how good-looking the shrimp was. Apparently, other customers love it too, because it's around 30–40 grams and most regulars order it whenever they come in. 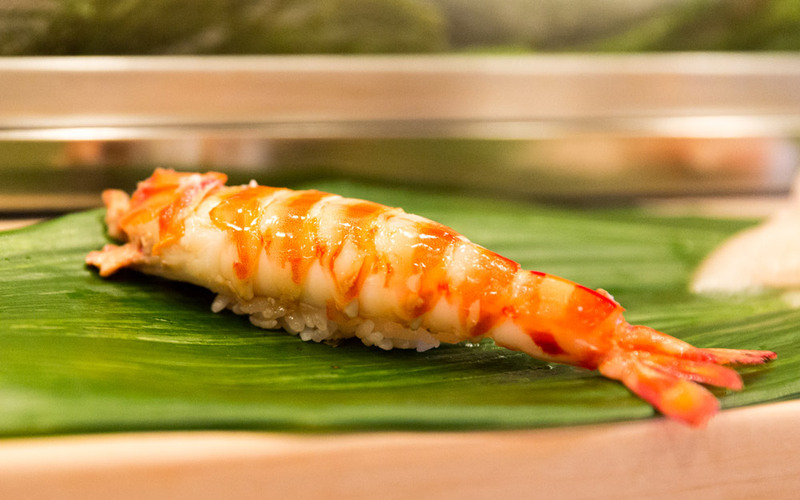 The chef told us, "An Edo-style sushi restaurant must have this prawn. Ours is considerably bigger than other places though. So if it's too big, I can cut it in half." He only mentioned this because you should eat it in one bite. Those of you with smaller mouths take note. Fourth we got hokkigai, or surf clams. It was pretty meaty and had a nice smell. We had some tiny hokkigai too, but the bigger one was definitely tastier. Next was chūtoro, a.k.a. medium-fatty tuna. You see, tuna (or maguro マグロ（）) is divided into different levels. There's ōtoro 大トロ（）, chūtoro 中トロ（）, or akami 赤身（）. 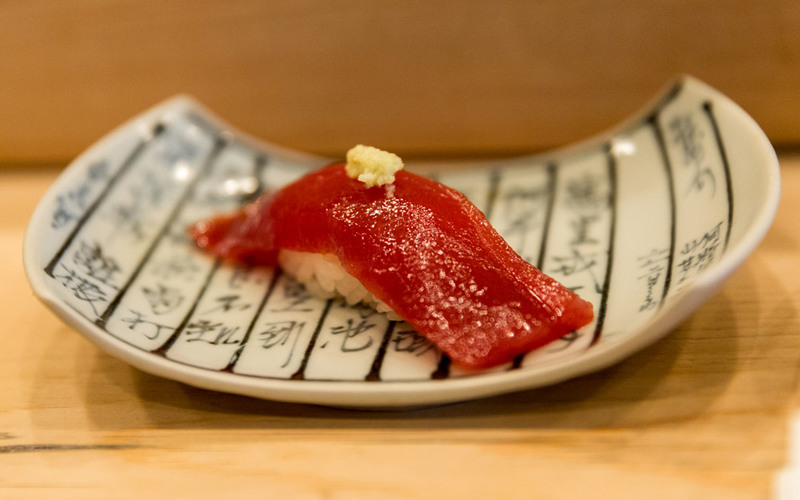 Ōtoro is the fattiest part and only 10% of a single tuna contains this fatty meat. We had medium fatty tuna, but it still melted on our tongues. You could tell by the looks on our faces that we got lost in the experience. It was sublime. Let's take a quick break and cleanse our palates a little. That's right, we're going to talk about pickled ginger (gari がり（）). During a sushi meal, you can eat ginger any time you want. People often use it as a mouth reset after eating something fatty, like chūtoro. 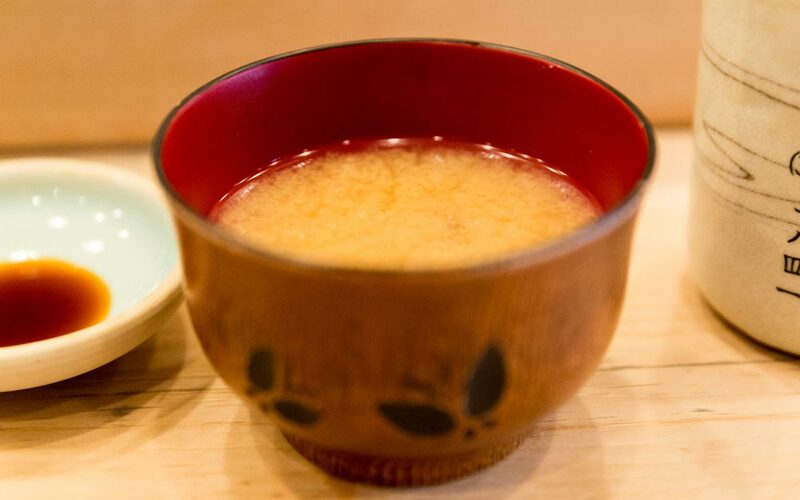 The ginger helps get rid of the residual oil left in your mouth from the tuna fat, which blocks a lot of the flavor from the next pieces of sushi. Since it's free, you can eat as much as you want. Most sushi places give you cheap gari, but Sushiya no Nohachi can't help but offer good things to their customers. They order special pickled ginger from a gari shop. Don't forget to enjoy their special gari too. It's quite good! For our sixth dish, we got sakuradai. This literally means "cherry blossom sea bream" and it's the name they give to madai (red sea bream). Nohachi's sakuradai takes the "sakura" an extra step further too. Before serving it, they sandwich the fish between salted sakura leaves, a technique known as sakuradai no sakurajime 桜鯛の桜締め（）. And because it's seasoned like this, you don't need soy sauce. The cherry blossom flavor wasn't overpowered by the salt or the fish either. I imagine that would be a difficult thing to balance, especially when it comes to a delicate flavor like cherry blossoms. As with many of their ingredients, this one was seasonal. 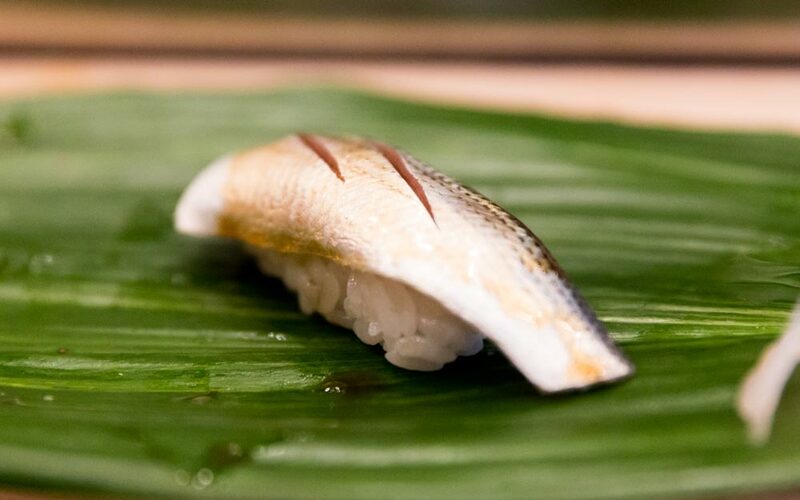 You can only try this beautifully tasty sushi in the spring. 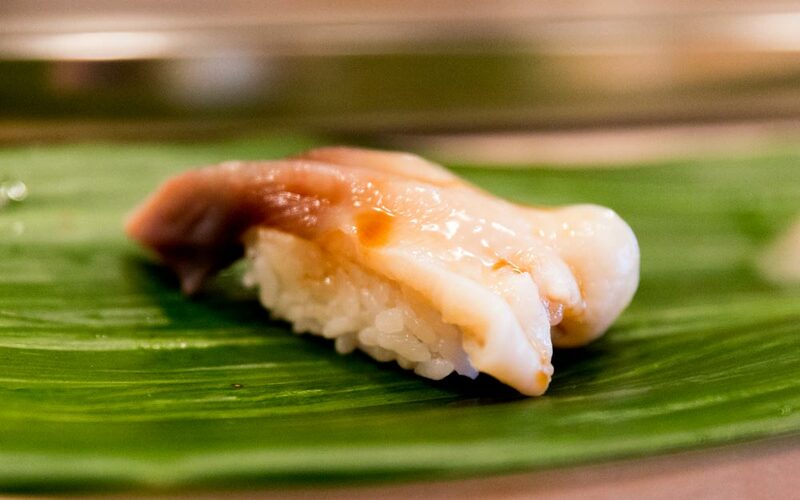 Seventh we got kohada, which took us back two hundred years, when Edo-style sushi began. The flesh of the fish was tightened from resting in vinegar and packed a little punch, but didn't feel like too much. 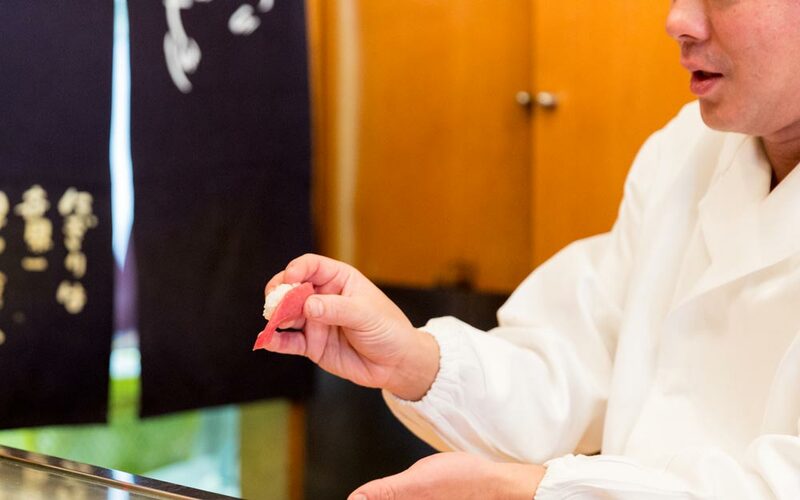 Although there are many older sushi like narezushi in Shiga Prefecture, which started in the Heian period around 1,400 years ago, Edo-style sushi brought about a new way of eating it. 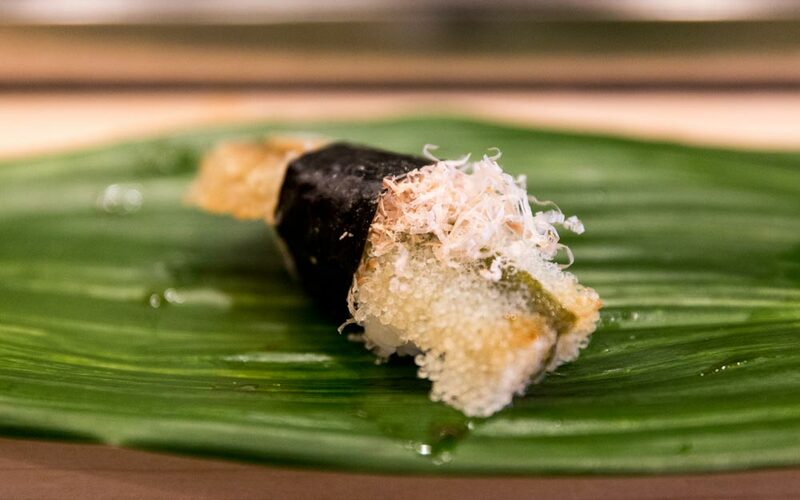 These bite-sized sushi weren't mainstream before Edo-style sushi made its mark. At this point, we got some miso soup. Miso soup is normally served earlier, but that day they needed some time to prepare it (we got there before the restaurant opened to the public). This was a special miso soup with shijimi clams, which blended well with the miso. Each clam was big too (usually they're pretty tiny). The chef said they use shijimi from Aomori. Eighth (we're getting close!) was soy sauce marinated tuna, known as zuke. Zuke is made with one of the old methods of preserving fish in Japan (i.e. soaking fish fillets in a bath of soy sauce and dashi). This method was almost forgotten after refrigeration became a thing, but it started regaining popularity a few decades ago. The most common fish to be used for zuke is tuna, but bonito, salmon, and jack mackerel are used too. This zuke had a great, vivid color and was extremely tasty! Ninth was mushi awabi, or steamed abalone. It wasn't a big piece, at least compared to some of the previous pieces, but it made up for its size in flavor. The fish were transported in a water tank to Nohachi, where they were prepared and steamed for three to four hours until tender. This was much appreciated, because we got to have awabi at its best. On it, he applied some sweet sauce that paired well. 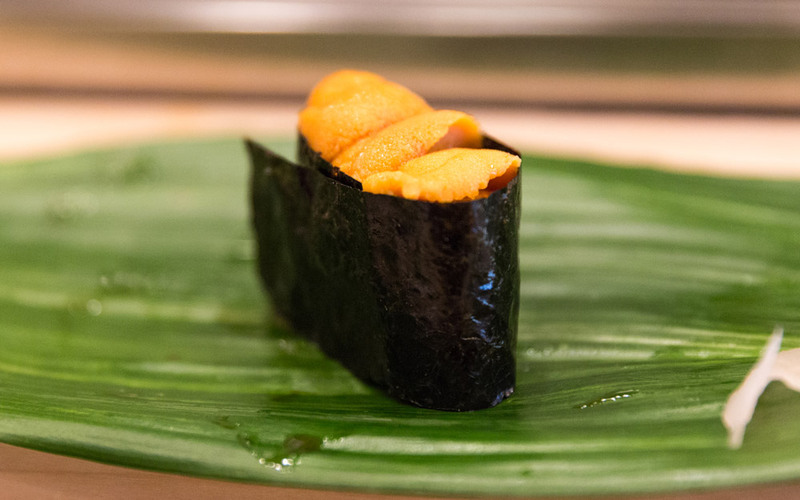 Number ten was bafun uni (sea urchin). The cool part about the kanji for this sushi: bafun 馬糞（） literally means horse dung. Keep that in mind next time you chow down on some uni. The cool part about the kanji for this sushi: 馬糞 literally means horse dung. Although the owner goes to Tsukiji Fish Market at 6:00 a.m. every day to pick out fish, the sea urchin comes straight from Hokkaido. Good thinking, because Hokkaido sea urchin really is the best. The owner told us that this sea urchin was from Eastern Hokkaido, but in the summer they get it from Hokkaido's northernmost island, Rebun Island. Uni from Rebun is "five times more delicious than this one." So if you're at Nohachi in the summer, be sure to order some uni (unless you don't like sea urchin in the first place, of course). By the way, we learned something cool at this point, a little tip for you sushi lovers out there. If you do want to add some soy sauce to a piece of sushi, you're supposed to take some of that pickled ginger in your chopsticks, dip it into the soy sauce, and then "paint" the soy sauce onto your sushi. If you dip the sushi directly into the soy sauce, it'll likely fall apart, making it too salty. It's nice to learn a new trick, isn't it? On to number eleven: komochi konbu (kelp with herring roe). 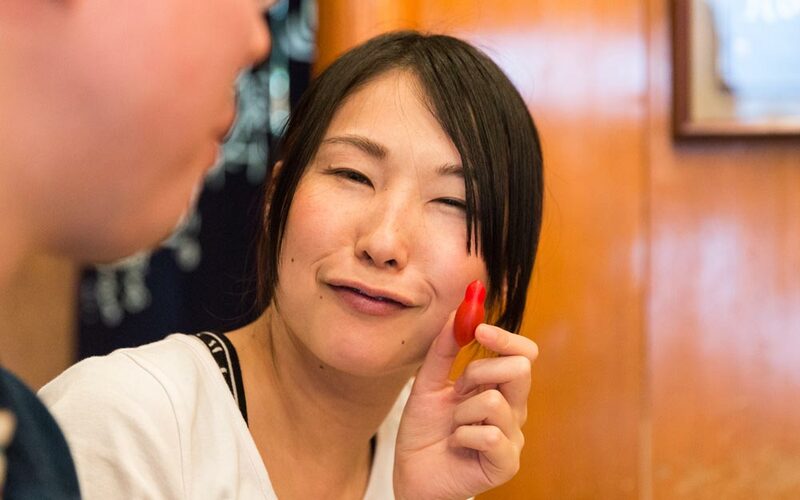 Unlike kazunoko, which is also herring roe, this roe is caught in a unique way. The herring swim up to the bay where fishermen have thrown their kelp and the herring lay their eggs on it. It had a nice, crunchy コリコリ texture. Finally, the last official item in our course! Kanpyoumaki (dried gourd shavings roll). This is a traditional staple of Edo-style sushi too. The bit of wasabi in it was a welcome contrast to the flavor. 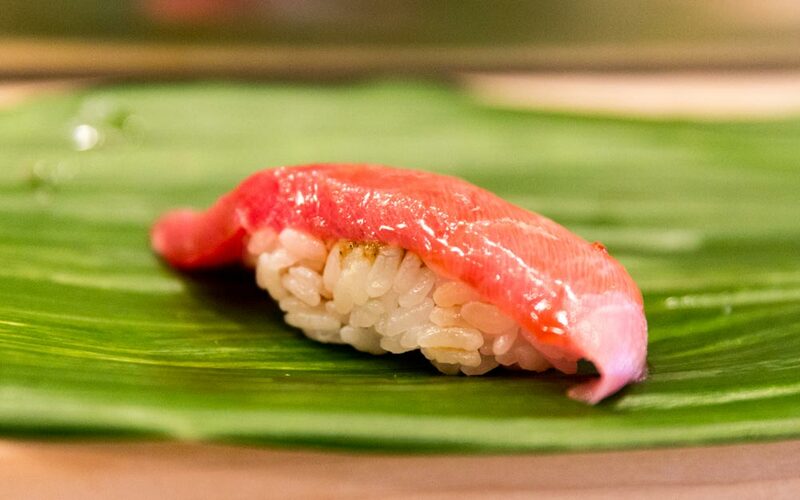 Almost any sushi restaurant will serve kanpyoumaki, but because it's time-consuming to make, most places don't make it in-house. The time needed depends on the individual kanpyou, but generally you have to wait for the dried gourd to rehydrate before simmering for a long while. The whole process takes several hours. Of course, Nohachi makes their own and it's very good! Now on to the unofficial stuff. First is tarako no wasabizuke, or "wasabi pickled cod roe." It seems like this was a freebie (or the chef lost track of how much sushi he had served us). This cod roe was sent directly from Hokkaido and had a nice flavor, followed by the tingling of wasabi. At this point, the chef asked us what we wanted for the finale, so we realized he was probably giving us some extra service on purpose. (Thank you, Nohachi!) We decided to get some nama-ikura, which is raw salmon roe. You don't need soy sauce for this either, because it's pre–seasoned. It was soft, delicious, and the flavorful insides of the roe gushed into our mouths. Apparently, October or November is the beginning of salmon roe season and it's the best time to eat it because the skin is even softer. In addition to all this, we got some "tears of the maiden" tomatoes from Kochi Prefecture. Because people are trying to increase their vegetable intake, Nohachi recently added farm fresh veggies to their menu. They serve different tomatoes at different times of year, depending on the season. This one was sweet and had more of an old-timey tomato taste (that is, it actually had taste, which was great). I liked it so much, I had to make this face. At the end, I made one additional order: rolled omelette, or tamagoyaki. It's said that if you eat the tamagoyaki at a given sushi restaurant, you'll know the skill of the chef, so sushi experts tend to order it at the beginning. Most tamagoyaki are like egg cakes with fish meat paste. 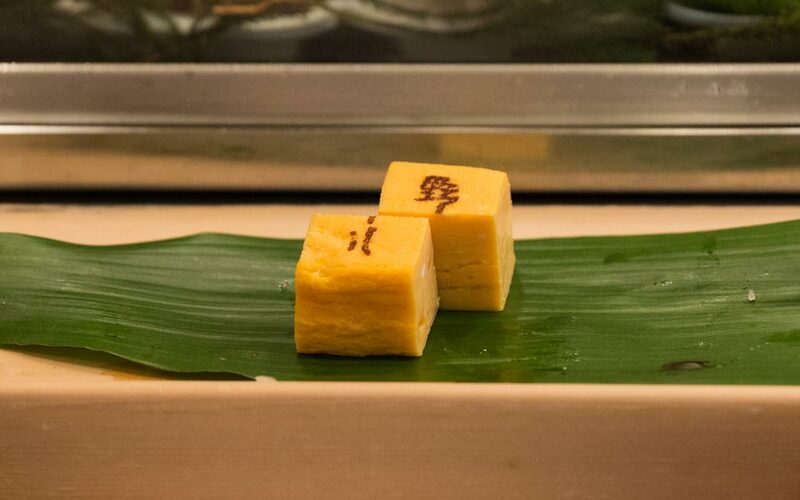 But Nohachi's tamagoyaki was dashimaki tamago, which was made from egg and fish broth. This way, it was fluffy but still robust. That's difficult to do when you're using broth! Anyway, although I already knew it because I had eaten so much sushi, I could now see how skilled he was because the tamagoyaki was great. If you are interested in how he makes this, there are tamagoyaki instructions and photos on the chef's blog. In the end, we were all extremely satisfied. We enjoyed our sushi and had a great time chatting because they were very open and friendly. For example, we talked about the treasures of Nohachi, which included a baseball autographed by Hideki Matsui. When we found out he loves baseball, we gave the owner one of Aya's stickers: a chibi Kyle Seager! Can you spot it? Speaking of stickers, they also put the Tofugu sticker on their fugu serving license, alongside all their other fugu license stickers. Hopefully that didn't invalidate anything! If you stop by Sushiya no Nohachi, see if you can find the sticker footprints we left behind. Although we came here after hearing tales of tiny sushi, we left not thinking much about that gimmick at all. 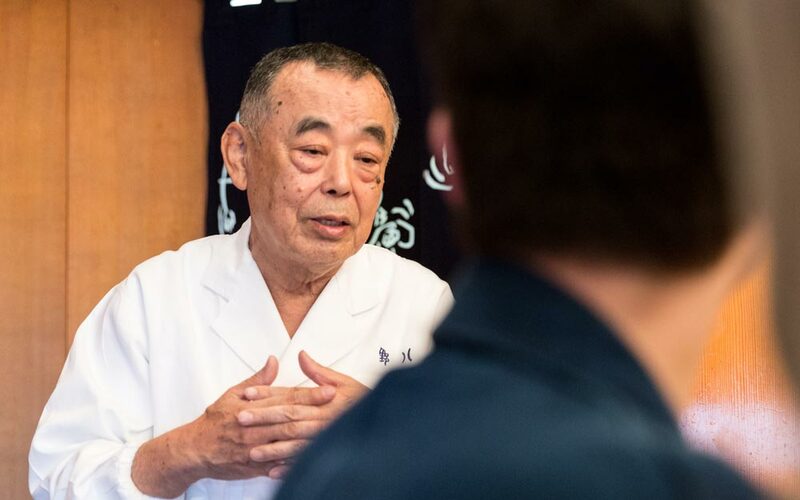 It was the sushi itself, and the people making it, that made Sushiya no Nohachi great (and a place worth coming back to again and again). 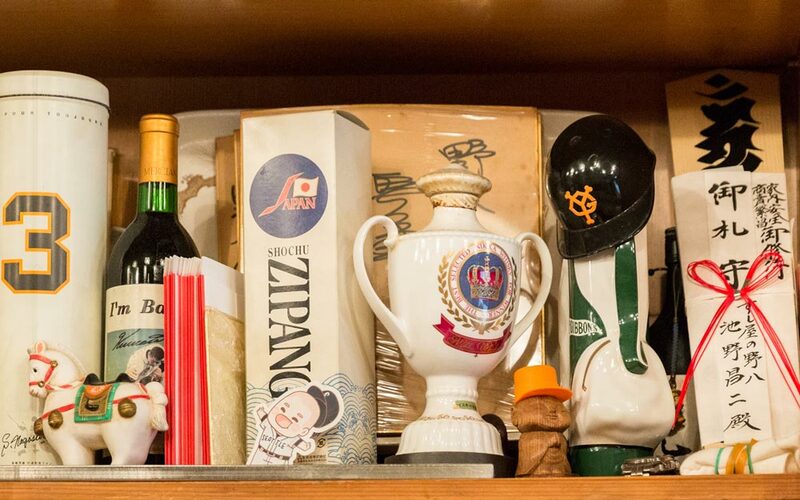 Our restaurant is located on a back street in the tourist area, Asakusa, and has forty-four years of history. 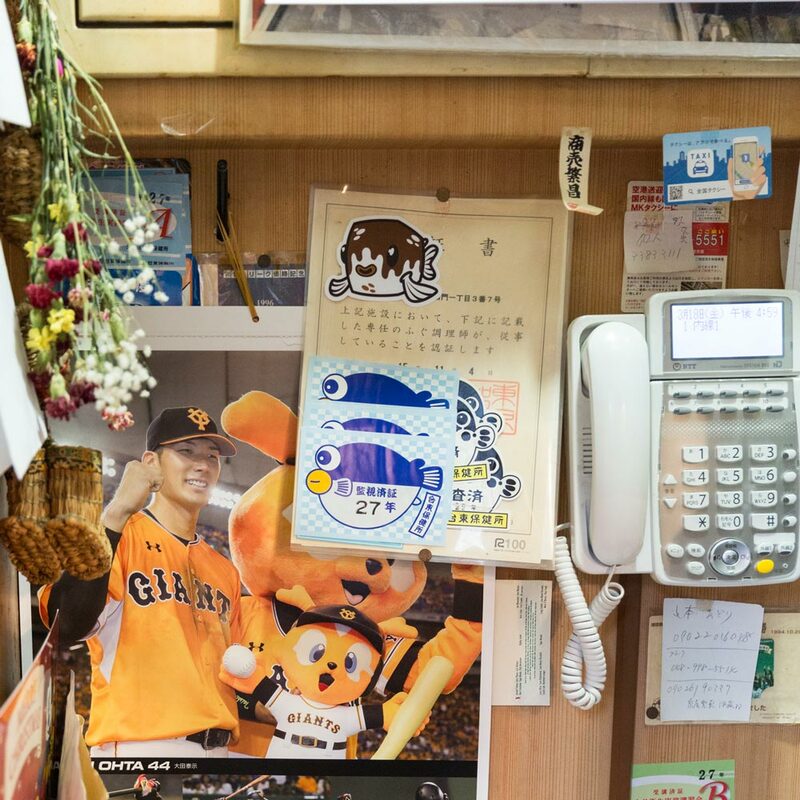 The restaurant is open from 5:00 p.m. to 2:00 a.m. and the average customer spends about ¥10,000. I know you guys are interested in the tiny one grain sushi, but please come to enjoy our delicious Edo-style sushi too! I love eating sushi myself, but my most favorite sushi changes as often as Japan's seasons. I want to eat seasonal sushi that is most delicious at that time and want people to enjoy the best sushi for each season too. So come here any time and we'll serve you the very best stuff for that time of year." And if you can't speak Japanese, fret not. They have an English menu and the staff is super friendly. Head on over and give it a try. The tiny sushi was cute and great for photos. All the sushi we ate here was very delicious, including the ones that were out of season. I’m curious how much better they would be in season. Although it’s on a back street, it’s located in the famous tourist spot of Asakusa and I’d like you to stop by if you are in that area. The sushi here is great. You can’t go wrong with this place. 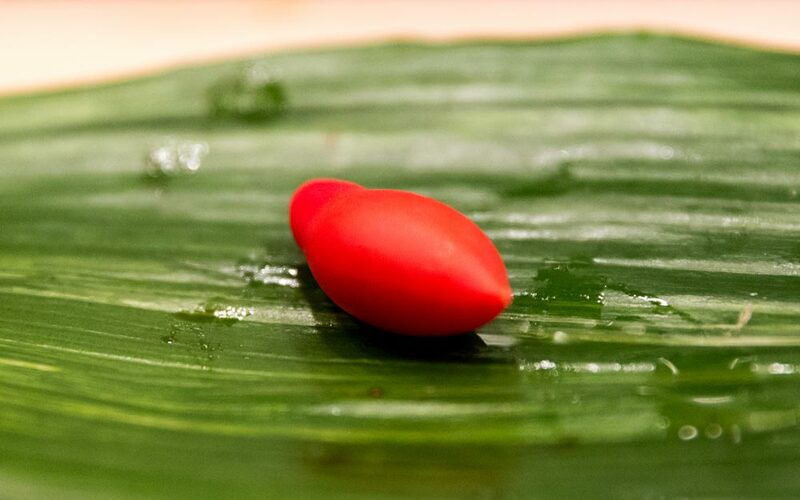 If you are a photographer bring a macro lens for the tiny sushi! I came here for the tiny sushi, but came away wanting more of the big sushi. The seasonal dishes were exceptionally good and I enjoyed talking with the chefs. They had a lot of interesting stories and were really friendly. I learned a lot about sushi that day (and filled my belly too). Good location. If you're a tourist, you're probably in Asakusa anyway, right? They do a great job keeping with the seasons when it comes to choosing their dishes. 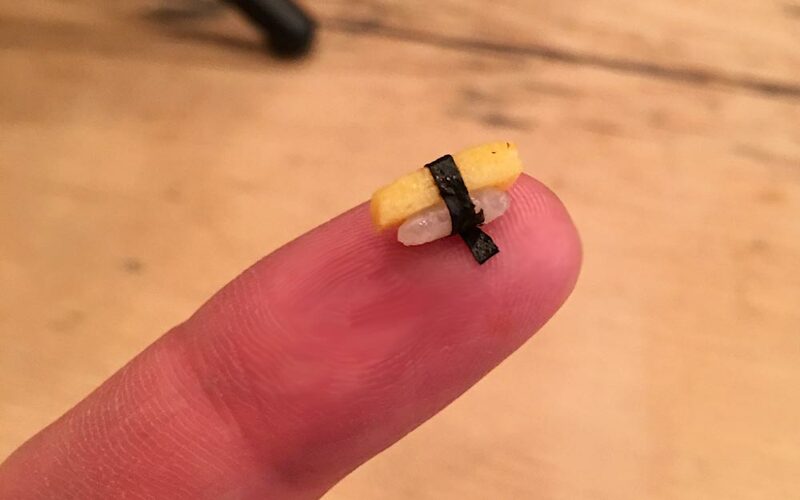 Sometimes the sushi is really, really small. English menu, in case you don't speak Japanese. Friendly chefs. They keep a casual atmosphere while still showing excellent skill. You may be able to run into sumo wrestler customers.